Troubled Italian airline Alitalia has applied for bankruptcy protection as it tries to agree a deal to ensure its long-term survival. The carrier has sought court protection from its creditors, effectively declaring itself insolvent. An administrator will be appointed to handle the process, with flights continuing while the firm plans a radical overhaul of its operations. Losing 2m euros (£1.6m) a day, Alitalia has survived on a 300m-euro state loan. Plans are being drawn up to split the carrier into two and to sell a stake in a new entity to a foreign airline. Guaranteeing the airline's future will depend on securing fresh investment and persuading its unions to accept large job cuts. Both Air France KLM and Lufthansa have expressed interest in investing in any new entity which emerges from the current business. Earlier on Friday, Corrado Passera, head of the airline's financial advisers Intesa Sanpaolo, confirmed that Alitalia's board was drawing up a request to seek bankruptcy protection. The move will give the firm breathing space to reach agreement on how the business can proceed. The government adopted new measures on Thursday aimed at speeding up bankruptcy proceedings, widely interpreted as a signal that Alitalia was set for such a course of action. Future plans for the carrier would see it divided in half, with its loss-making operations remaining under bankruptcy protection and potentially being liquidated. Profitable short-haul routes would be separated into a new business, controlled by a consortium of Italian investors including budget airline Air One which would effectively be merged with Alitalia. 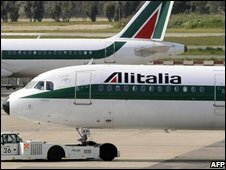 Italian media have speculated that the new firm will employ 7,000 fewer staff than Alitalia's current 19,000 strong workforce and operate flights to about 50 fewer destinations. Previous attempts to sell the business to a foreign airline have foundered over union concerns about job losses and unease over the severity of the airline's financial problems. The airline's perilous position was put into perspective by Roberto Colaninno, appointed to take charge of the new entity that emerges from the restructuring. 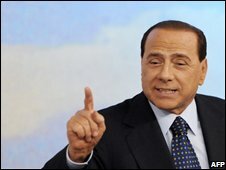 "No one can buy Alitalia in the state it's in," he told La Repubblica newspaper. "With all respect, I am not Merlin the magician. The business is toast. It doesn't exist any more. There's nothing left." Alitalia has been crippled in recent years by strategic indecision, poor industrial relations and soaring fuel costs. Its shares were suspended earlier this summer while the firm has delayed the release of its 2007 accounts.